Did Temple's Fran Dunphy take a subtle shot at Penn State recruiting? 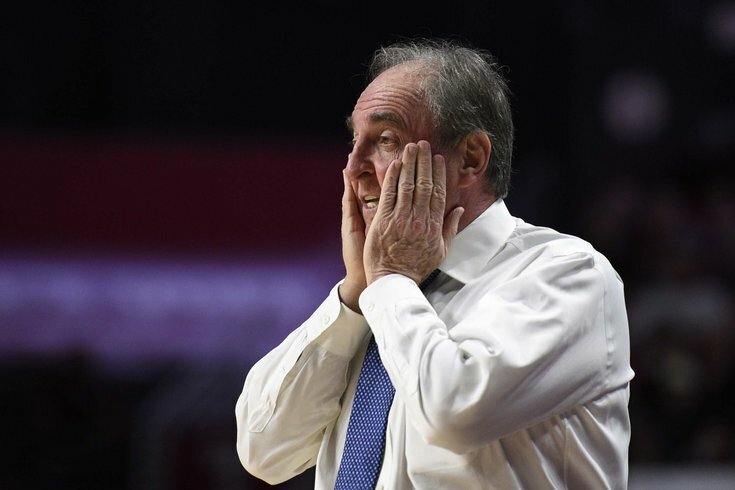 Temple Owls head coach Fran Dunphy reacts to a call on the court during the first half against the UCF Knights at Liacouras Center. Another season for the Temple University men's basketball team has ended in relative disappointment. For the fourth time in five years, the Owls have missed the NCAA Tournament, and will instead head to the NIT, where they're set to play Penn State. What began as a promising year, with a 7-3 start and wins over eventual tournament-bound teams in Clemson and Auburn, ended in mediocrity and a 17-15 record. All of which is to say head coach Fran Dunphy may or may not be a bit frustrated. So, I took that into consideration when I read his response to a reporter who asked something along the lines of "How the hell does Penn State have seven Philly kids on their roster, including Tony Carr, who is very good and should be wearing Cherry and White?" The Temple-Penn State match-up is particularly intriguing because the Nittany Lions feature seven players from the Philadelphia area, including four from Philly’s Roman Catholic High School – led by first team All-Big Ten point guard Tony Carr. During Dunphy’s 50-year association with the Big 5, as both a player and a coach, Penn State has never before been so connected with Philly high school recruiting. Coach Dunphy's response to the question has been misinterpreted. He has nothing but respect for Coach Chambers and the Penn State program and said to me that "They deserve a lot of credit for how they have recruited Philadelphia." Let me be perfectly clear: I have zero knowledge or insider information on the recruiting process at Penn State or any school for that matter. What I do know is there are people calling for Dunphy to be fired. I also, upon first glance, interpreted Dunphy's response as, "Yeah, I would love to recruit all these Philly kids but I actually play by the damn rules." Again, this is my read on Dunphy's answer and not a comment on Penn State's recruiting practices. But regardless of whether or not you think Dunphy should keep his job, if I was a highly-respected basketball coach on the hot seat who felt like I was being undercut in my own city because others are playing dirty, I would be pissed, too.